According to the newspaper account, Volke’s daughter Reka lived with her for about a year shortly after her marriage in 1872. She then returned to live with her grandparents, Ulfert and Fredericka Maria Hermanns (Lichtsinn) Behrens where she stayed until her marriage and making the household a four generation one which included her great-grandmother Trientje Ulferts (Claassen) Behrens. For fourteen years Reka lived with her grandparents in northeastern Adams County, Illinois. She married a fellow Ostfriesian, Gerd Ideus, in 1888. 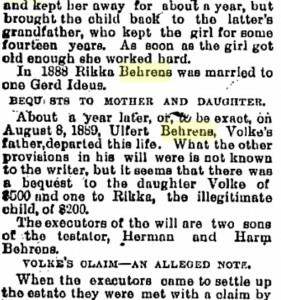 Grandfather Ulfert died in 1889, leaving several bequests in his will, including ones two Reka Ideus for $200 and another to his other granddaughter named Reka, Reka (Sartorius) Janssen for $200. For readers who may be getting confused–the mother of Reka (Behrens) Ideus was Volke (Behrens) Sartorius and the mother of Reka (Sartorius) Janssen was Trientje (Behrens) Sartorius. Sisters Volke and Trientje married brothers. Ulfert did not name any of his other approximately twenty grandchildren in his will. He did leave a bequest to his daughter Volke (Behrens) Sartorius as well. However, Volke wanted a little more than she was given. Volke thought she was entitled to the money Harm Habbus had given to her father when her daughter Reka was born nearly twenty-five years earlier. She also thought that she was entitled to compensation from her father’s estate for the value of her daughter Reka’s work when Reka lived with her grandparents. And so the German native did a very American thing. This entry was posted in Uncategorized and tagged glittering stars, harm habbus, volke behrens sartorius. Bookmark the permalink.